99.76% (about 674,459 dunams) of state land allocated for any use in the Occupied West Bank was allocated for the needs of Israeli settlements. The Palestinians were allocated, at most, only 0.24% (about 1,625 dunams). Some 80% of the allocations to Palestinians (1,299 dunams) were for the purpose of establishing settlements (669 dunams) and for the forced transfer of Bedouin communities (630 dunams). Only 326 dunams at most were allocated without strings for the benefit of Palestinians, and at least 121 of those dunams are currently in Area B under Palestinian control. Most of the allocations to the Palestinians (about 53%) were made prior to the 1995 Interim Agreement (the Oslo II Agreement, in which the West Bank was divided into Areas A, B and C, and transferred control over 40% of the West Bank to the Palestinian Authority). The High Court of Justice is currently facing the issue of the evacuation of the Palestinian village of Al-Khan al-Ahmar, which the state wants to demolish and expel its residents to another area. The residents of the village are asking the High Court of Justice to stop the evacuation until the Civil Administration discusses the detailed construction plan they prepared for the village’s approval, which the state has refused to consider. The data revealed here about the state’s systematic abstention from allocating land for Palestinian use attests to the severe and structural discrimination that prevents the villagers from obtaining the land and from getting their village retroactively approved. The question of the legality of this discrimination will be hanging in the background of the upcoming High Court hearing. Background: “State Land” – Of Which State? Land is one of the main and most precious public resources in every place and society. The division of this resource is key to development and growth, and the manner in which land resources are distributed is an expression of government policy with a decisive influence on the welfare of the residents. The term “state land” is misleading because there is no “state” in the occupied territories, neither the State of Israel nor an independent State of Palestine. The more appropriate term is “public land”—lands that belong to the public. In independent countries, it is the state that manages public lands. The state decides to whom to allot the land and assigns it in leases or for various uses. In the occupied territories, the person who manages the public lands is the Israeli military body, whose policy is dictated by the Israeli government, while the Palestinians have no assigned right to influence this policy. Until the Interim Agreement in 1995 (Oslo II), the IDF was responsible for all residents of the West Bank and the Gaza Strip, including the conduct of daily life in all towns and villages. But since then has been directly responsible for “only” 60% the West Bank (Area C) and indirectly on certain aspects in the rest of the West Bank, as well. Before 1967, most of the area that the Civil Administration defines as state land was not considered public property. Over the years since then, Israel has declared close to one million dunams of “state land,” and has included almost all of these lands within the jurisdiction of the local settlement authorities. The Palestinians were therefore precluded from using this land even before the land was allocated for any use. The military administration is obligated to take care of­ the protected residents of the occupied territory (in this case, the Palestinians). As the Supreme Court held: “The military government is not entitled to sell government property, and its legal status in that property is the same as that of a recipient of a benefit only.” This is both according to the provisions of international humanitarian law and Israeli administrative law (HCJ 393/82 Jam’iyat Iskan al-Malamun v. Commander of Israel Defense Forces , 785 (1983) 791). As the Association for Civil Rights in Israel explains: Israel holds state land in an occupied territory as a trustee, and must do everything possible to preserve and develop it for the benefit of the local Palestinian population. The very use of state land for the purpose of building settlements and/or developing infrastructure and industrial zones not in favor of the Palestinian population constitutes a violation of international law. The fact that the activity of the Custodian of Government and Abandoned Property in the Civil Administration has been conducted for years without transparency and in violation of basic rules of proper administration is not coincidental. A situation in which no one knows how much state lands there is, how much was allocated and to whom makes for almost unlimited possibilities for manipulation. Now it turns out that the overarching policy of Israeli governments throughout the years has been to allocate as much land as possible for Israeli settlement use, and not to allocate any land to the Palestinians who make up 88 percent of the West Bank population. In 2013, the Civil Administration gave Bimkom and the Association for Civil Rights in Israel (ACRI) information on state land allocated to Palestinians in a petition filed under the Freedom of Information Act. The information provided at the time stated that the total amount of state land allocated to the Palestinians was 8,649 dunams, about 1.27% of the state land allocated in general. Peace Now asked the Civil Administration for details on the purpose of these allocations, and in the Civil Administration’s response (obtained after two and a half years) it turned out that the figures given to Bimkom and ACRI in the court proceedings were misleading. 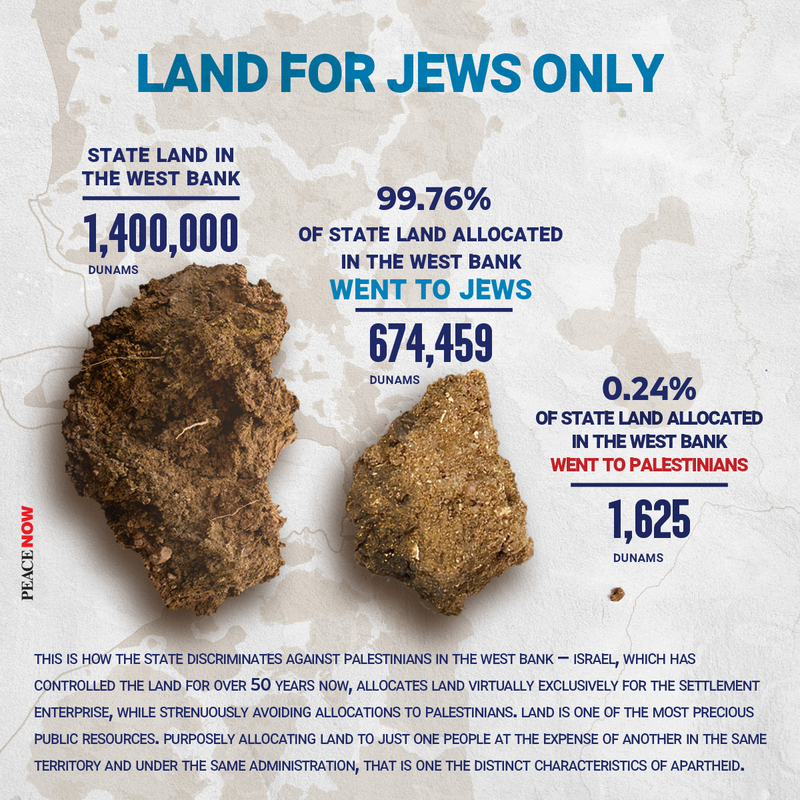 In fact, only 1,625 dunams of state land were allocated to the Palestinians, not 8,649. The difference between the data (about 7,000 dunams!) can be explained from the response of the Civil Administration to Peace Now: “A review of all the materials revealed that the data provided included all land allocations to the Palestinians, and not necessarily allocations of state lands.” In other words, the vast majority of the 8,649 dunams allocated to the Palestinians were not state lands, but private lands of Palestinians considered absentees, which were used extensively in the late 1960s and early 1970s. In 1968, Israel began to establish settlements in the Jordan Valley on private Palestinian land, and in return gave the owners alternative lands, mainly those of other Palestinians considered absentee, or what were called “Badal” lands or “Tabdil”. As an aside, it should be noted that at the same time, the military administration had prepared a list of all the absentee landowners whose land was allocated to the Palestinians or the settlers (the “One Hundred List” – named after the number of people on the list) and determined that they would not be granted entry permits back into the West Bank. Allocation of Palestinian lands – In the late 1960s and 1970s, Palestinian land was allocated to Israeli communities in the Jordan Valley, through land swaps, in which Palestinians were granted alternative land owned by absentees, and by direct allocation of land belonging to absentees on the scale of thousands of dunams. These allocations, which were defined in the documents of the Legal Advisor to the Civil Administration as seemingly illegal, continued to be carried out by the Administration later. (Emphasis added). To download the state’s response, click here. 1968 – Allocation of land for the purpose of establishing settlements in the Jordan Valley (669 dunams) – Approximately 41% of the land on the list was allocated in 1968 in the Jordan Valley. In the years immediately following the 1967 war, Israel established many settlements in the Jordan Valley and took private land from Palestinians and in return gave the owners other lands. Supposedly, the 669 dunams allocated to the Palestinians in the Jordan Valley in 1968 were part of the “land swap” that Israel imposed on the landowners. It is possible that even the 50.2 dunams allocated to the residents of Jiftlik in 1972 were part of an exchange deal for the establishment of a settlement, but we have no information about this. Allocations prior to the Oslo II Agreement – The Interim Agreement signed in September 1995 divided the West Bank into Areas A and B (40% of the West Bank) where civil control was handed over to the Palestinian Authority, and Area C (60% of the West Bank) where Israel is in charge of all civil and security control. Most of the land allocated to Palestinians (866 dunams, about 53 percent) was allocated before the Interim Agreement, when Israel directly administered all Palestinian towns and villages. Despite the full Israeli responsibility, almost no public land has been allocated for Palestinian use: of the 866 dunams allocated before 1995, 669 dunams were allocated as aforesaid for the purpose of establishing the settlements; And of the remaining 197 dunams, at least 121 dunams are currently located in Area B, which is under Palestinian control anyway. Allocations for the forced transfer of Bedouins – According to the data, nearly 40 percent (630 dunams) of the land allocated to the Palestinians was done for the purpose of “splinting” (Heb. kibua), or permanently resettling, the Rashaida tribe (270 dunams) and the Jahalin tribe (360 dunams). In the 1990s, when the government expanded the Ma’ale Adummim settlement, it sought to evict the Bedouin residents living there from the area designated for the settlement. The High Court did not allow the state to “throw” the Bedouin out of the land without allowing them alternative land, and the state decided to allocate to them land of several dozen dunams in al-Jabal, on the land of Abu Dis, adjacent to a huge garbage dump of Jerusalem and the surrounding area. It should be noted that of the 630 dunams that were counted by the Civil Administration as lands that were “allocated” to the Palestinians, most of the land was not allocated in practice. The land in the Nu’ayman area that was designated for the Rashaida tribe was not allocated to it, and the plan to relocate it has not taken place so far. Of the land of al-Jabal, designated for the Jahalin tribe near the garbage dump, only parts of the 360 dunams were allocated to Bedouin families that were uprooted from their lands in the 1990’s. The rest of the land is planned to be given to the Bedouins of Khan al-Ahmar and other communities Israel wishes to evict. 2015 – Allocation of 54.5 dunams for agricultural cultivation – The allocation of 54.5 dunams for cultivation is likely the case of land used by Palestinians for decades, for both residential and agriculture purposes. 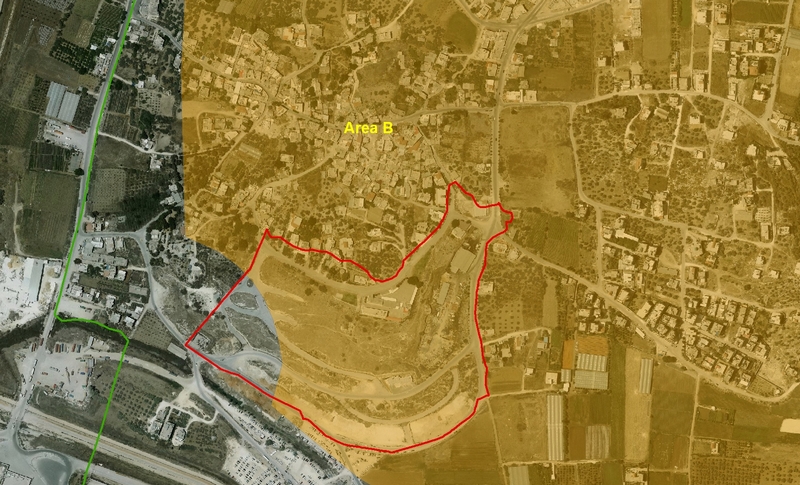 Recently, the Civil Administration issued eviction orders against the landowners, and following appeals filed with the Appeals Committee, the Civil Administration decided to agree to allocate the land for Palestinian use. It should be noted that in practice, the allocation contracts were not signed with the state, since the Palestinian landowners refuse to pay the rent the state requests for what they perceive as their private land. In March 2009, Bimkom applied to the Civil Administration, in accordance with the Freedom of Information Act, to ascertain the amount of state lands allocated in Area C to Israelis and Palestinians. After no substantive response was given, Bimkom and the Association for Civil Rights in Israel filed an administrative petition against the Civil Administration demanding the receipt of the information. The Administration’s response at the time was that the information was not in its hands, and that hundreds of hours of work were needed to prepare it. During the discussions it was evident that the Civil Administration, the body that is entrusted with land administration in the territories, had no precise information regarding the lands under its responsibility and had no idea about the state lands that it had transferred to the Settlement Division. At the end of 2013, following the Court’s intervention, an official response was issued, which was full of inaccuracies, for it found that 8,649 dunams (1.27% of allocated state land) were allocated to the Palestinians while 674,459 dunams (98.73%) were allocated for Israeli settlement use. 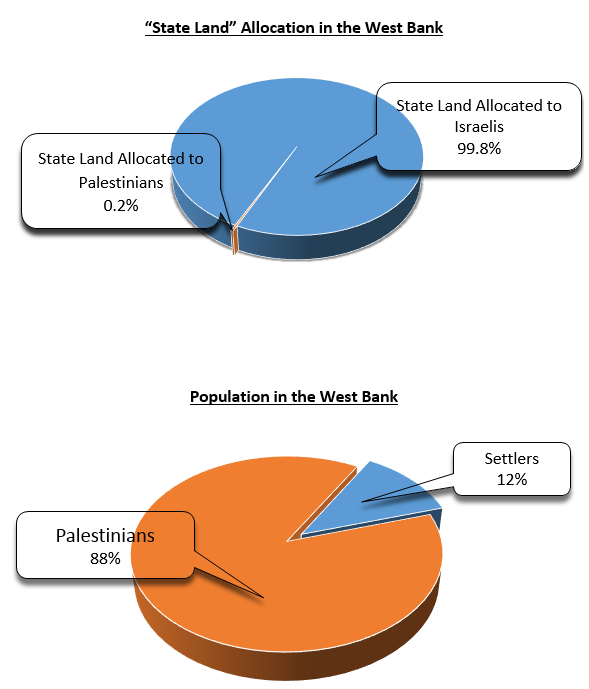 It should be noted that, as explained in the previous sections, it now appears that in practice only 1,625 dunams of state land were allocated to Palestinians, and that the data provided in the framework of the petition by Bimkom and the Association for Civil Rights included approximately 7,000 dunams of absentee property allocated to the Palestinians. 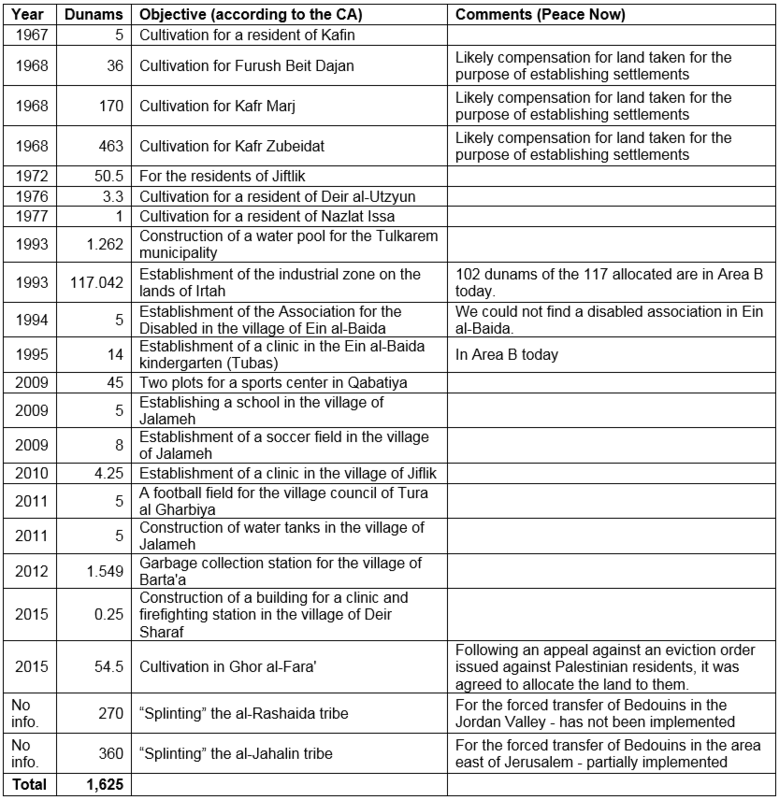 In March 2016, Peace Now asked the Civil Administration to provide explanations on state land allocated for Palestinian use – a list of the objectives for which the land was allocated. Eight months later, in November 2016, and following many reminders, the Civil Administration refused to provide the information, claiming that much work was required to examine thousands of allocation files. In November 2017, the Movement for Freedom of Information filed a new application that significantly reduced the scope of work, to obtain representative examples of the allocation contracts. In this case, too, many reminders and complaints were sent to the Freedom of Information Unit in the Ministry of Justice, until a year and a half later, an answer was received (in part).